JOINING ME in this journey is,..
- A freelance content writer who has an overwhelming desire to collect Starbucks Global Icon mugs from different countries, from which she already visited South Korea, Hong Kong, Singapore, Thailand, and of course Cebu and Manila (amongst other Philippine destinations that she’s been to). 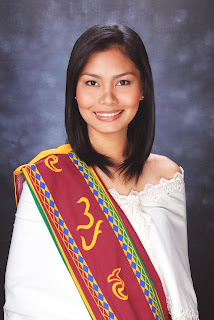 An alumna of the University of the Philippines, Diliman, Mai graduated with a degree in BS Clothing Technology. She is single by civil status but happily in a relationship with her BEAU (as she romantically calls him). Her strength springs from knowing that she has a loving family, and of caring and honest friends. Their love and support is what keeps her going. "I like to travel. Well, I actually love it! That would have to be one of the constant things in my life that keeps me intact and rejuvenated. It keeps me in tune with sceneries, cultures and traditions other than my own. Being a travel enthusiast, she has also found a career in the world of writing. Seeing and reading published works (whether on print or online) always gives her that sense of fulfillment. Her projects typically revolve around travel-related contents and proofreading/syncing telenovela scripts. Not only do these avenues of opportunities bring her to distant places around the globe. These slowly paved the way to her being recognized in the blogosphere. She is the owner of BUDGET BIYAHERA, a travel site that has already made remarkable achievements and commendations. For Mai, anyone can travel without splurging too much. She believes in budgeting, yet still leaving room for those ‘few bumps’ on the road. She always includes expense sheets from every journey made as reference, so that her readers may have ideas on how to make every trip easy, or at least bearable on the pocket. She was already featured in TURISTA MAGAZINE and TRAVEL MAGAZINE, whilst flaunting her unforgettable experience in Ilocos Norte. 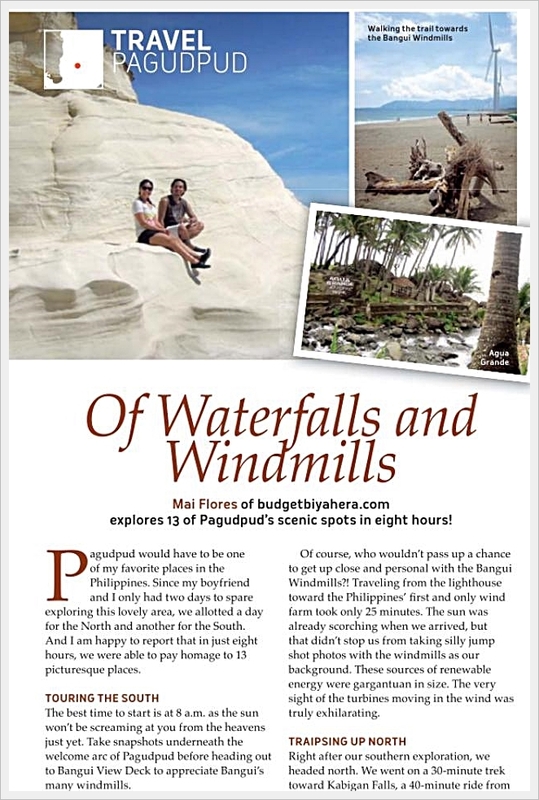 Her amazing encounter with the Kapurpurawan Rock Formation in Burgos, Ilocos Norte, the cinematic view of the Bangui Windmills, and the breathtaking Kabigan Falls were all noteworthy. During this trip to Ilocos Norte, there was this one person whom she met that truly inspired her. 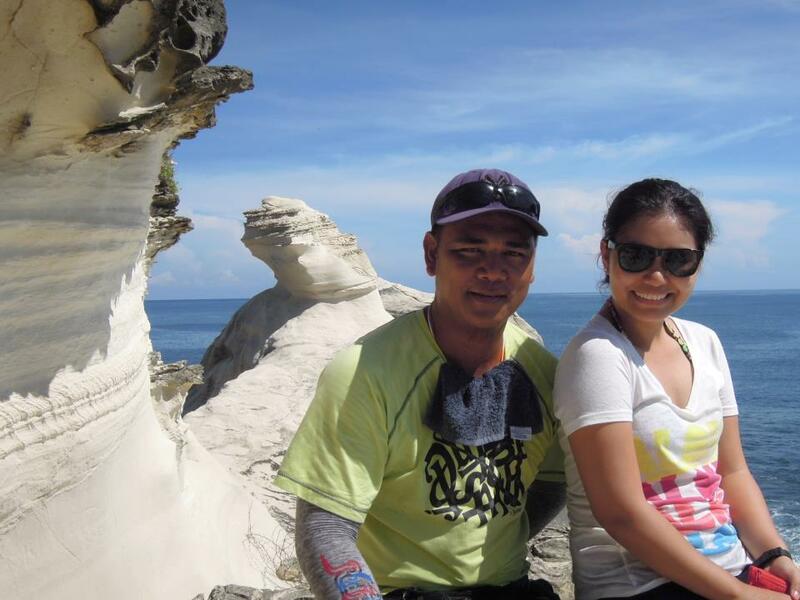 "When I traveled to Ilocos Norte last June 2012, I met a humble tour guide in Pagudpud named Raphie Respicio. For that one whole day that we got to spend with him (my beau and I), I soon realized that he was extraordinary. He went out of his way just to cater to the needs of his guests --- from customizing his tricycle into a more comfy ride to being the all-around guide (tour guide, photographer, historian). And because of his being a kind-hearted person to serve others, I paid it forward by blogging about his life and of his wonderful work ethic. Soon enough, he was thanking me for the many guests that he has been receiving all because of my blog. Guys like Kuya Raphie made me see how valuable my traveling ventures are. That's why I never stop sharing my experiences." "I've always loved Mark Twain's words of wisdom. He speaks of the realities of life. I've actually made the words "Explore. Dream. Discover" as one of my mantra's, to help remind me of what life has to offer. It keeps me in tune with what life is all about. And with this, I've come to learn how to balance both work and play from this meaningful travel quote." Actually, I have high respects for people who are so humble inspite of being successful in their chosen career. You're one good example, Mai. I love reading Budget Byahera's posts and travels and also enjoy her as one of my friends after knowing her from the FBW Bloggers Night Preparation. Budget Biyahera is so well-known that the woman behind it deserves nothing but praises and good words. Looking forward to more of her travels and tips which is very handy for all the newbie and experienced traveler out there. Humility reflects a person's character. Even the highest of profiles in the world can be humble without degrading oneself. I read her articles too and yes she includes expenses sheet. Kudos to her! More travel!!! Those expense sheets make her travel site more helpful to other tourists, local or foreign. Actually, Mai are blessed with two distinct and admirable traits. The first one is her being a natural kind-hearted person. She has this simple yet charismatic character. Second, she truly is an A-lister when it comes to writing. She has the passion for both that's why it's easier for her to do two things at the same time and enjoy the experience as well. I respect humble people like you and congratulations for your success in your chosen career. Mai Flores as my featured personality truly deserves a spot in my site because of her being low profile inspite of her success. We have plans to travel the Philippines one of these days. I will surely check out your blog. 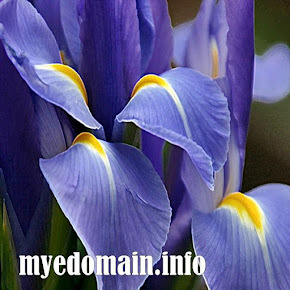 You can check out Mai's site anytime. You'll get more travel guidelines as you go through every article she posted. Those mugs are great souvenirs and will always remind her of her noteworthy travels. you really are inspiring us. with all the countries you had visited it credits you a lot of knowledge. .
She truly is an inspiration to many and being the Budget Biyahera herself, I believe she's an authority when it comes to traveling. Such a nice lady and a beautiful one. I am a fan of her Budget Biyahera. She writes quality posts. I'm a great fan as well, Sir Papaleng. She's one of my favorites and you're included too. wow congratulations you've been a long way now! more bloeesings in the future and nice to know something about you too! Ms Mai Flores is the one and only, Budget Biyahera. I'm really privileged to have her joined me in this journey through life. Collecting Starbucks Global Icon mugs is included in her travel must-dos. I've read her blog as well she's very detailed and provides useful information about the places she has visited. I love her writing style and how she presents her detailed expense sheet. No wonder, more tourists are taking time out to check her latest post. She deserves to be feature. I enjoy reading all her travel posts. She's a good and humble person so she deserves all these compliments. Kudos to Mai. A well traveled BIYAHERA herself. True! She's been to many places already and for sure she'll have more travels in the near future. But her foot is injured. Maybe, she has to rest a little longer. I'm honored to feature her. She's actually giving so much pride in my new site. Budget Biahera is an awesome travel blog. Mai is very detailed, I love her expense sheets super helpful! Her travel site is indeed very helpful to new and old backpackers who wish to have fun and worthwhile trips. That's great! Good luck to you Ms Ganessa. I'm sure you'll achieve your goals sooner than you expect. Just keep believing in yourself and have faith. I love reading travel blogs as I like to travel too. I wanna be featured in a magazine too. 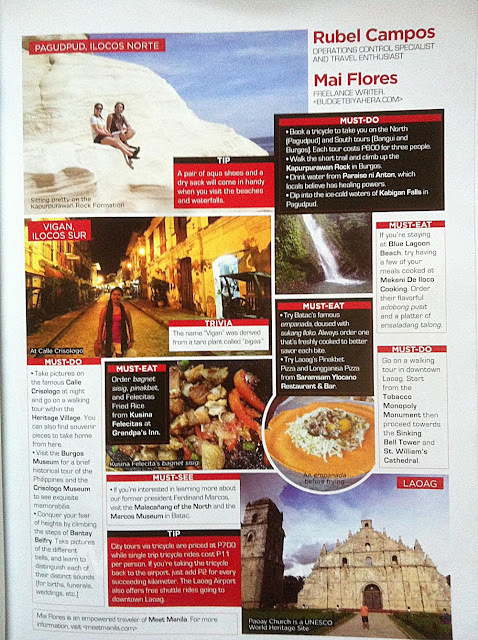 I really enjoy reading travel sites and magazines, too. It's like I'm actually seeing the beautiful places before my eyes especially with excellent captures of majestic scenery. Keep doing what you love to do and stay happy. I hope your foot is well enough to plan for your next out-of-the country escapades. I never thought this blog is one-of-a-kind... Thanks! I'm truly delighted to hear that. Budget Byahera is one of the travel webpages, which I like and keep on reading. The writer of that site has the full grasp of her forte on travel and she's also one of my preferred content writer. More power Mai Flores!